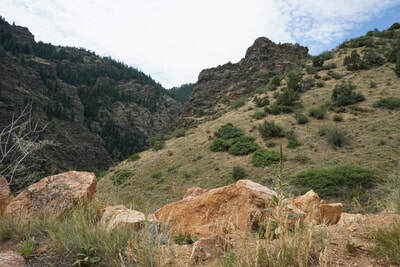 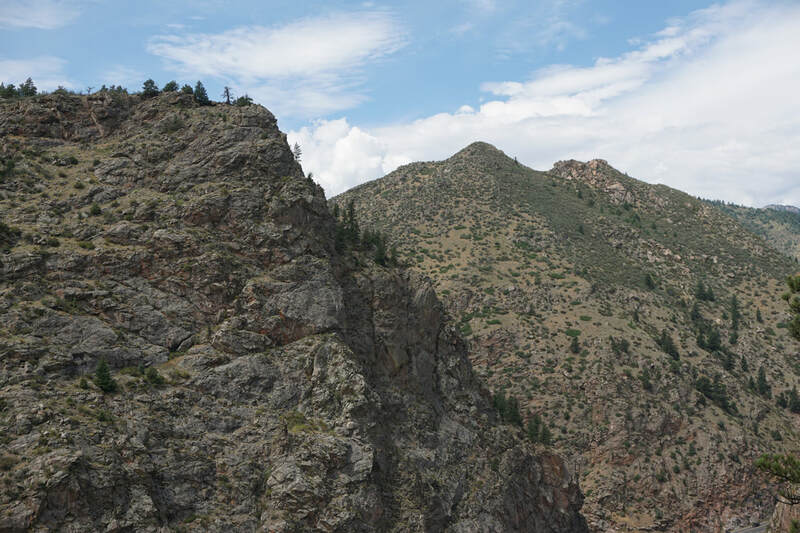 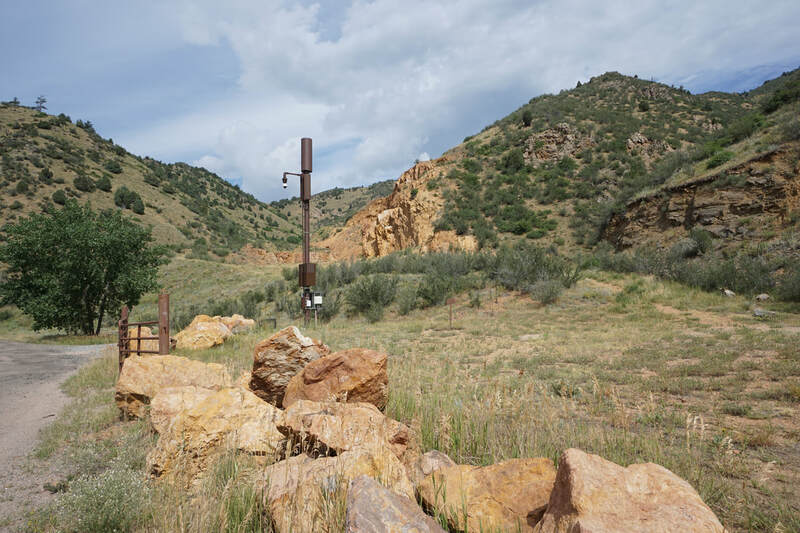 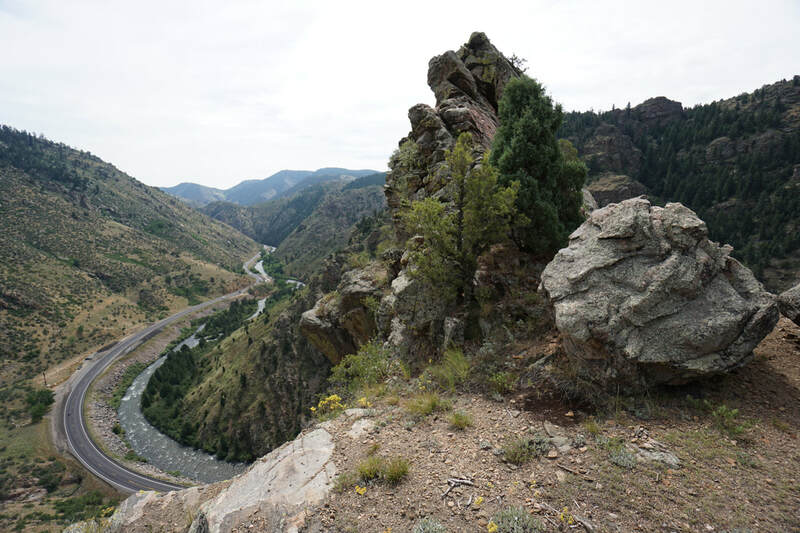 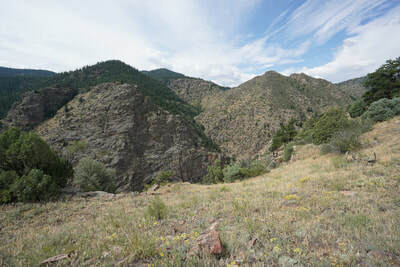 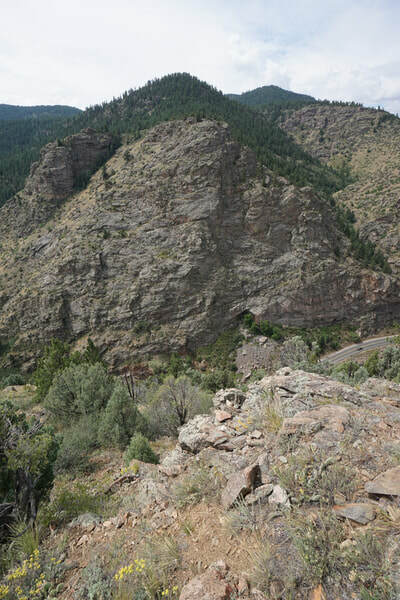 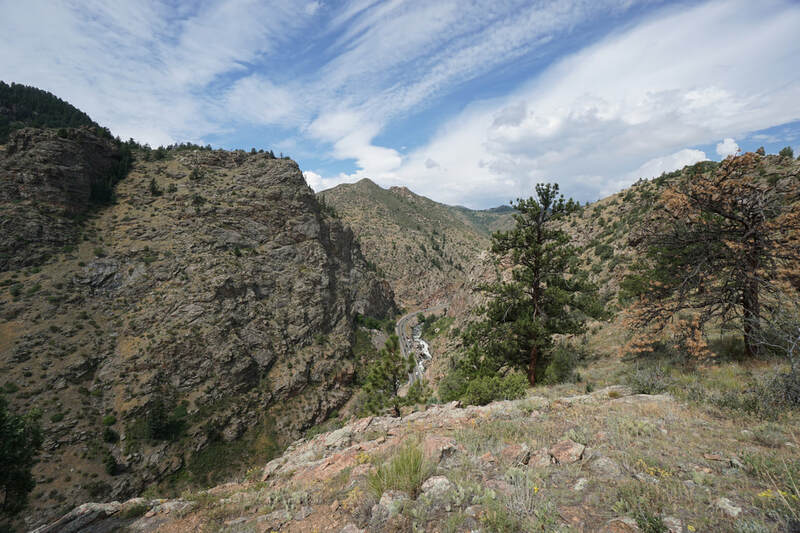 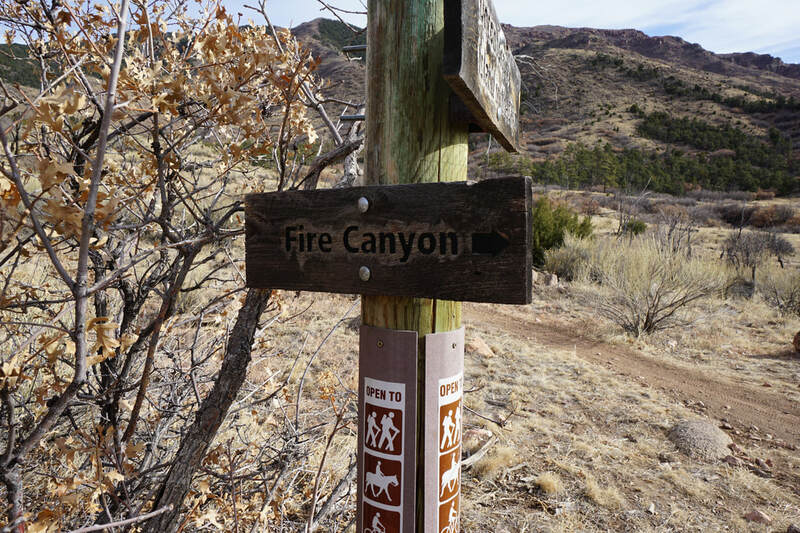 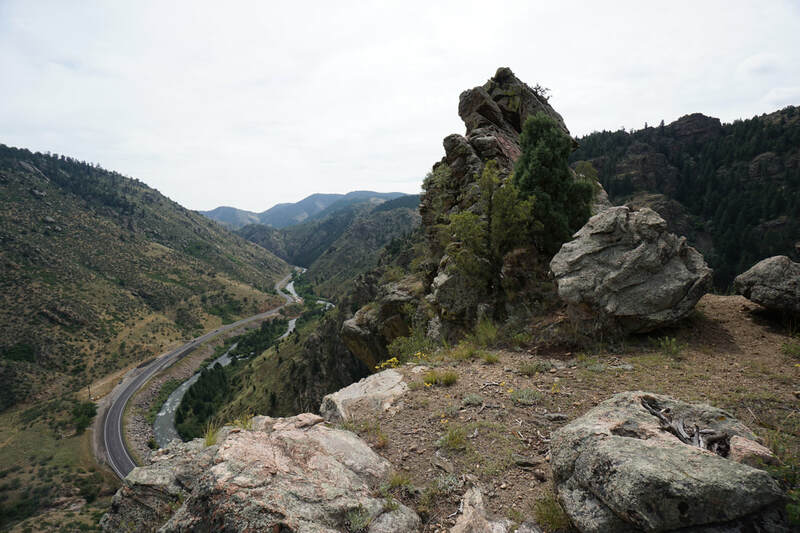 DIRECTIONS: The trailhead is located along Hwy 6 in Clear Creek Canyon, about 2.5 mi west of Tunnel #1. 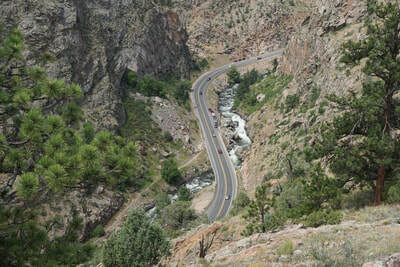 The pullout is on the north side of the road with enough space for a few cars. 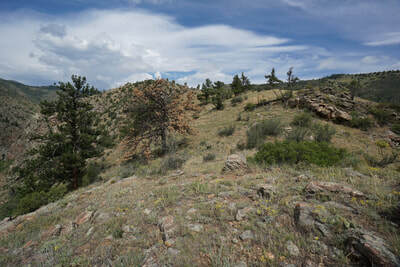 There is a locked gate with a trail on the other side of a line of boulders restricting motorized access. 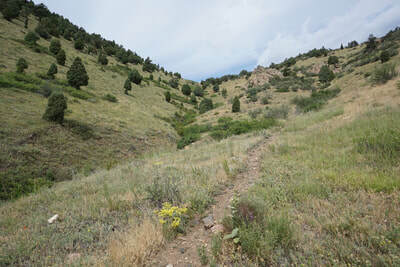 There is no trail sign. 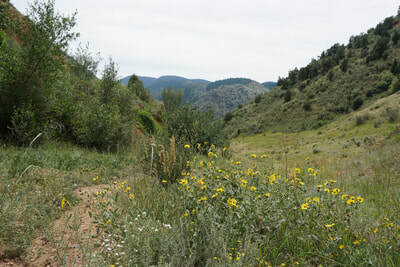 If you live in Denver, you've undoubtedly driven by this trail hundreds of times without realizing it. The trail is not on the Clear Creek Canyon Park map and there is no trail sign. 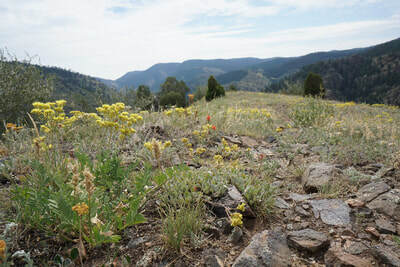 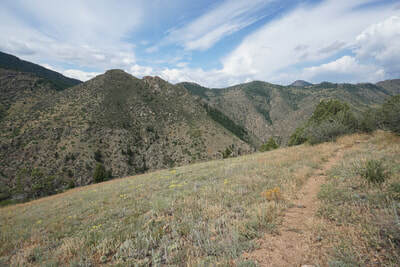 There is however, a good trail all the way to the top of Huntsman Gulch. 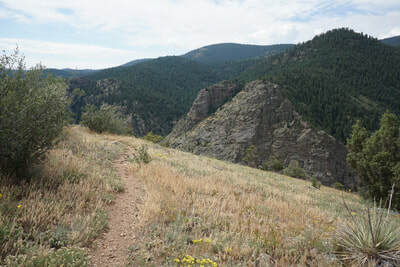 The sign at the gate prohibits shooting and hunting but the lack of a no access sign means that the trail is open to hikers. 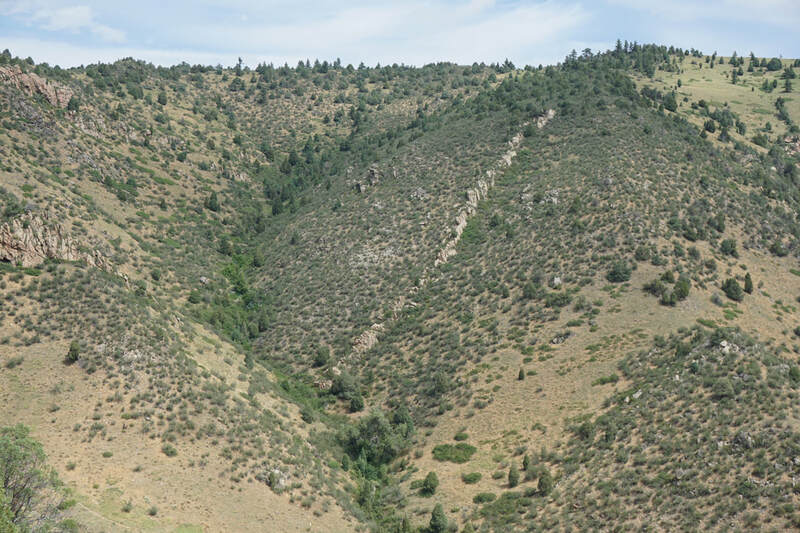 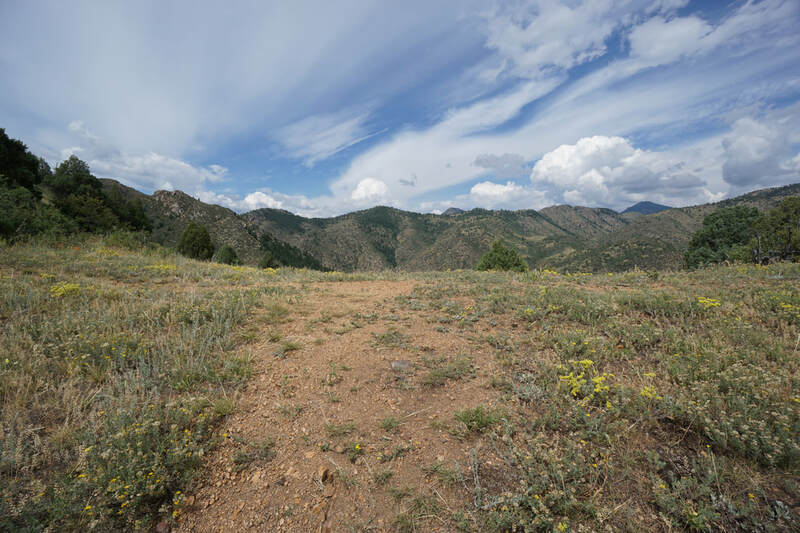 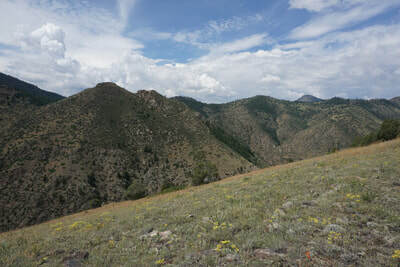 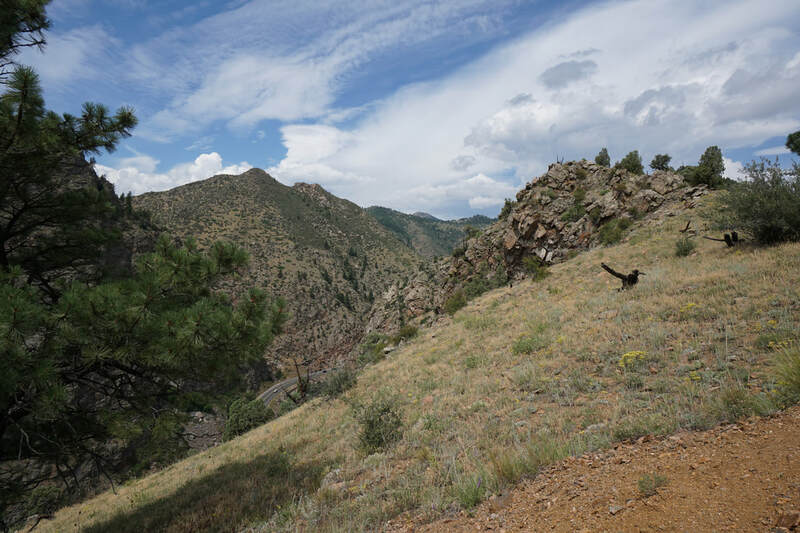 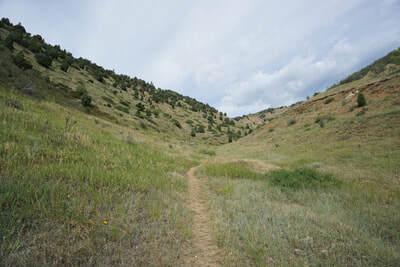 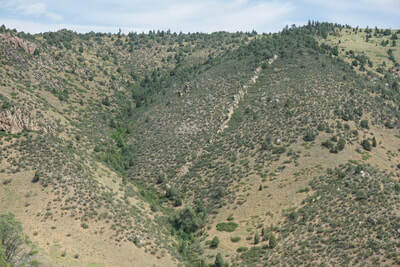 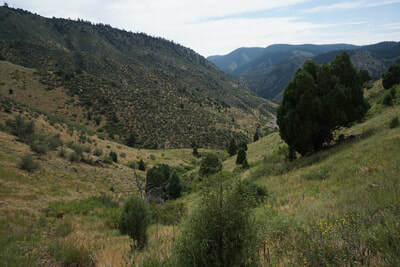 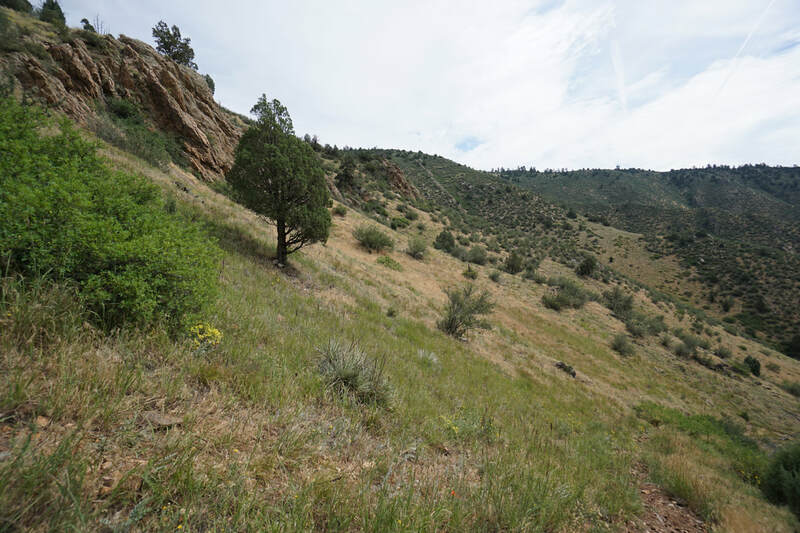 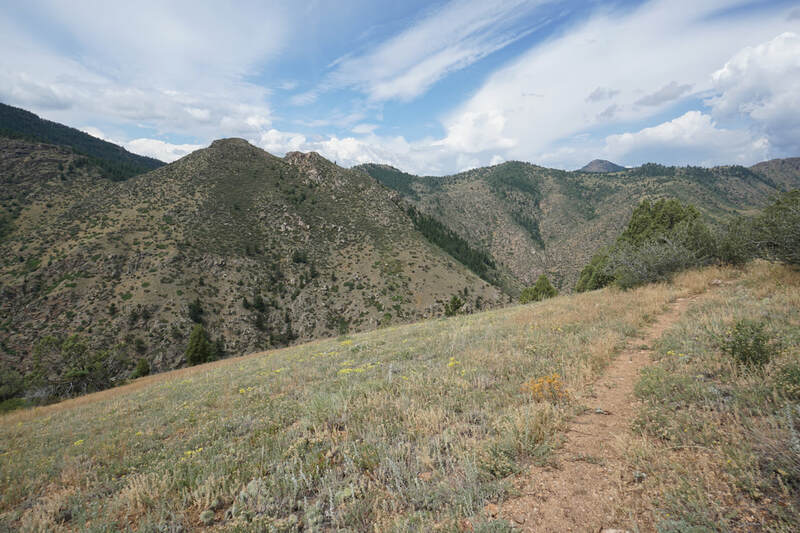 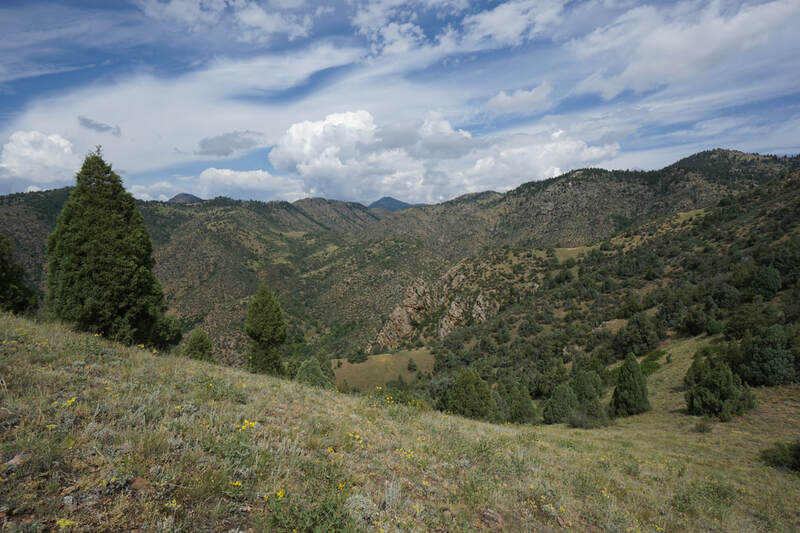 The trail travels up through Huntsman Gulch and since there is no official trail designation, I'll refer to the trail and the features along the way using "Huntsman" as a title, e.g. 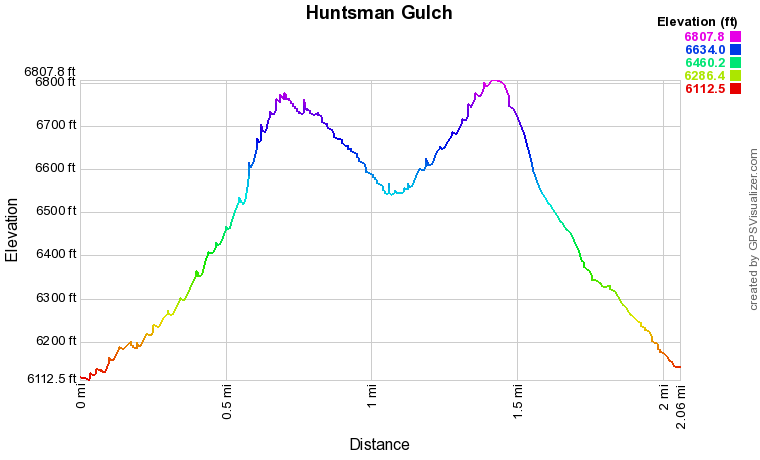 Huntsman Saddle. The trail starts by climbing up past an old quarry or highway maintenance borrow material site. 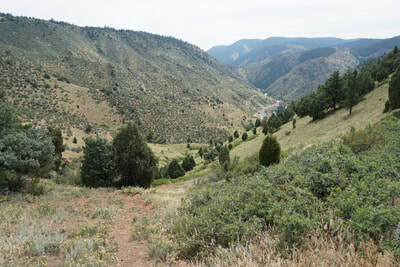 Just past the site the trail enters Huntsman Gulch. 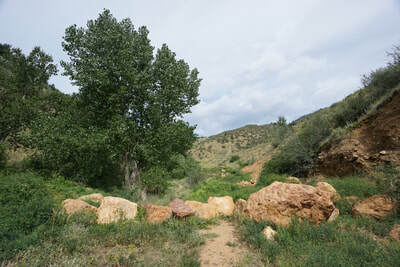 There is a row of boulders meant to curtail access but, again, since there is no sign and a good trail, climb over the boulders to continue on the hike. 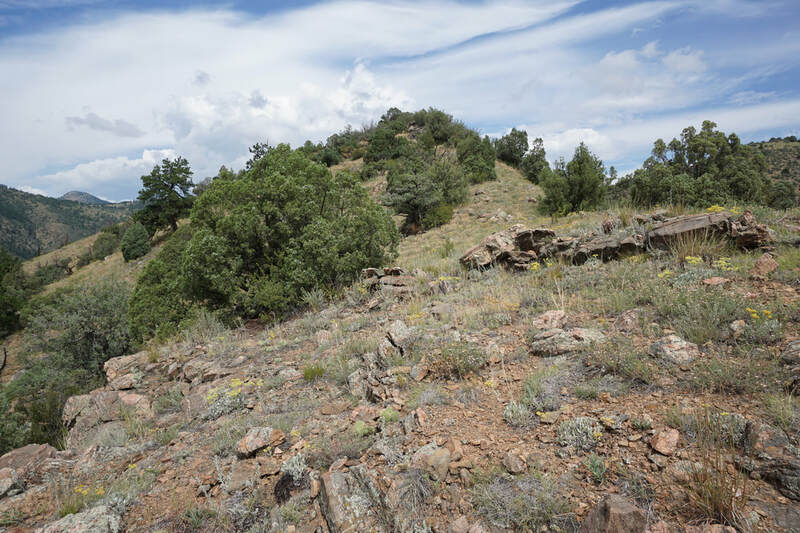 Soon, you'll be away from the hustle and bustle of Hwy 6 and find yourself climbing through a very pleasant basin with interest geologic features scattered throughout. 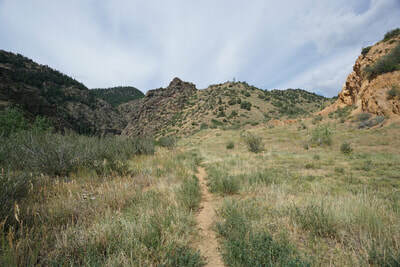 The trail climbs up through the gulch towards Huntsman Saddle. The trail gets a bit steeper as you near the saddle. 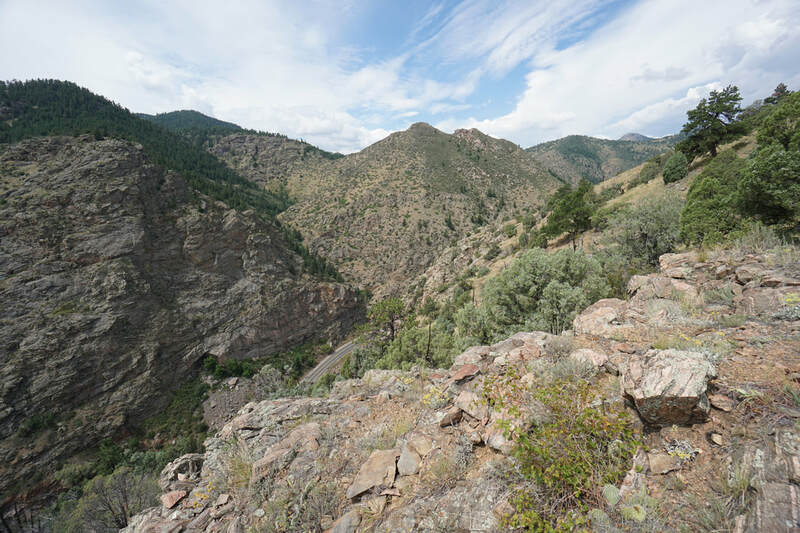 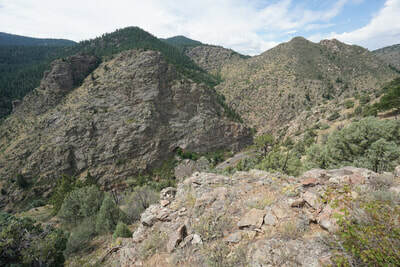 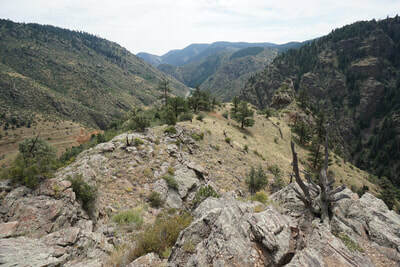 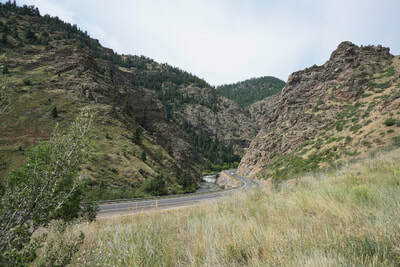 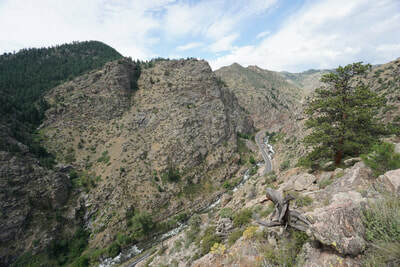 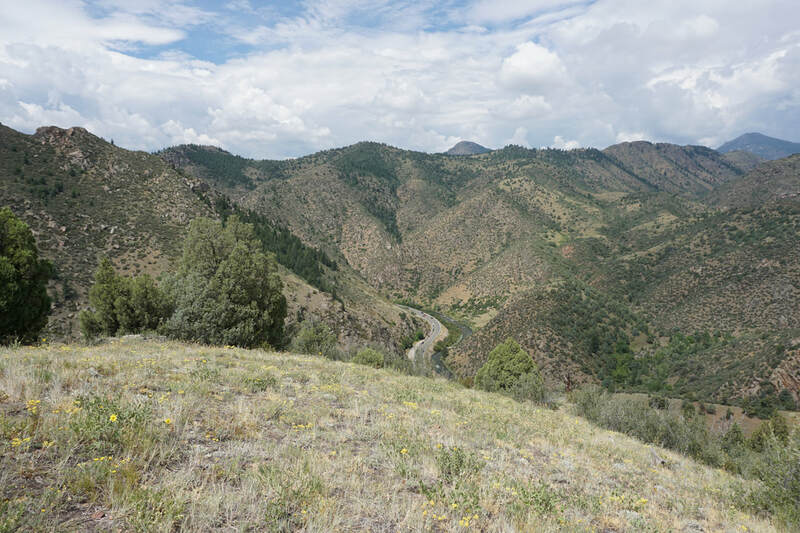 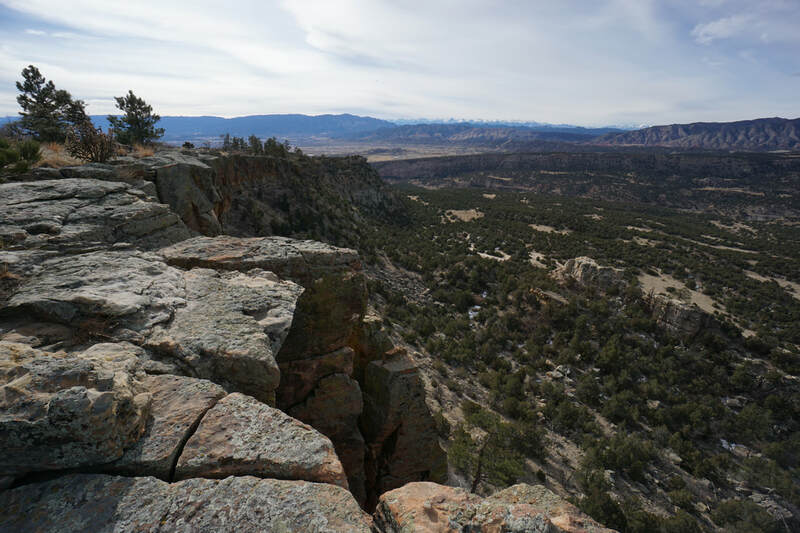 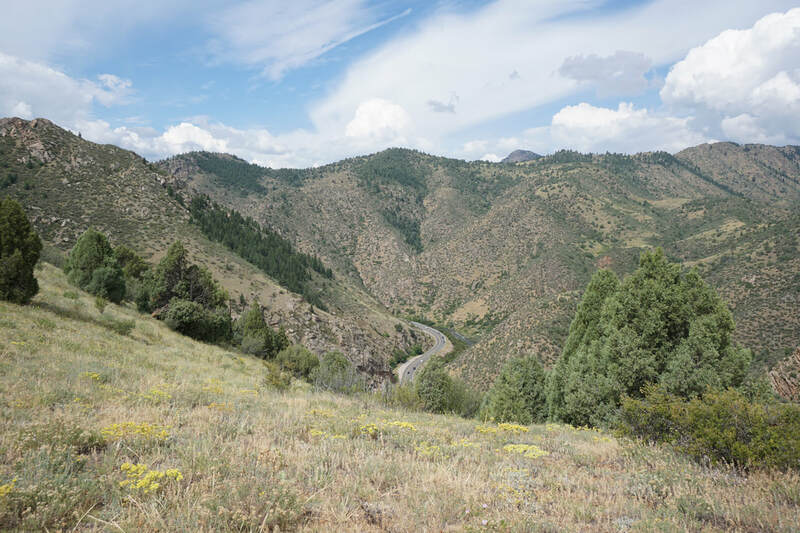 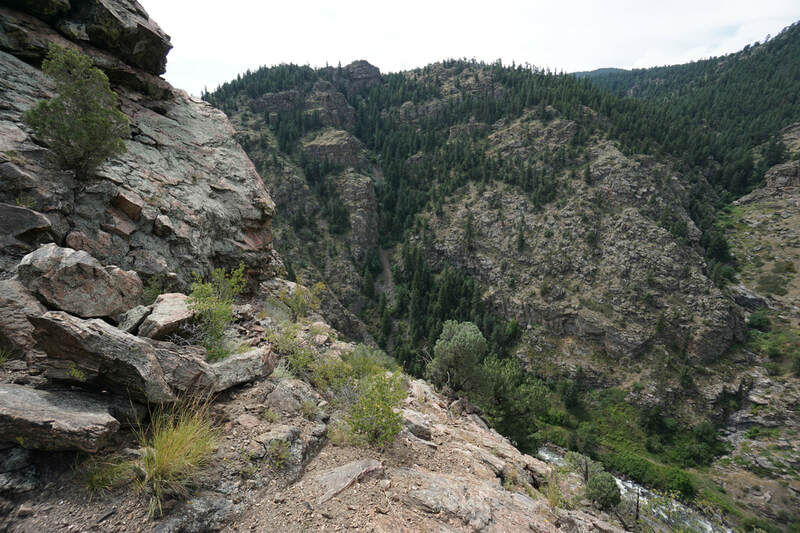 The views from the top of the saddle are wonderful looking down Clear Creek Canyon in both directions. You also get to view side canyons that few people get a chance to see. To the north is a fence with Privat Property/No Trespassing signs. 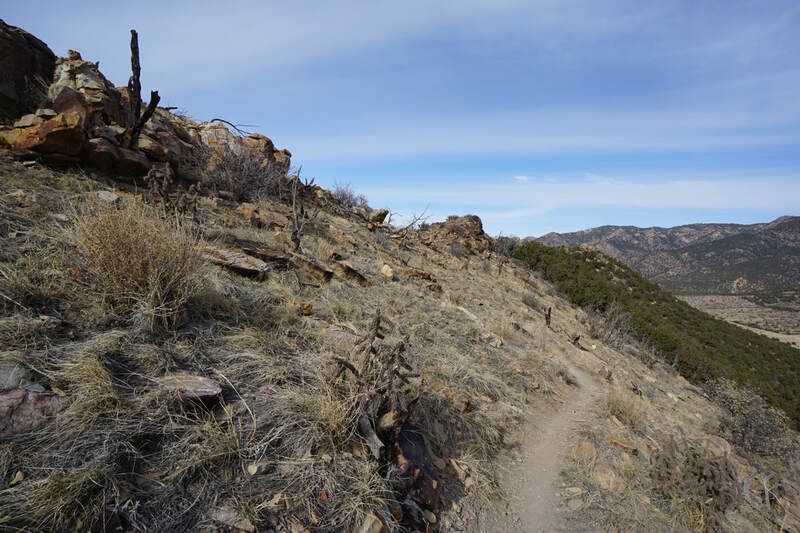 Although there is a trail continuing past the fence, please respect private property and stay on the open space side of the fence. 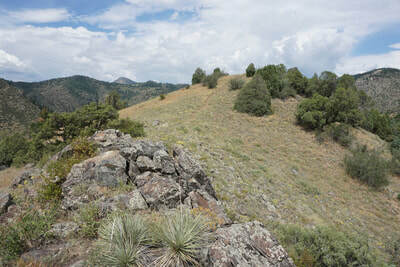 To the south of the saddle, the trail continues up a steep hill. 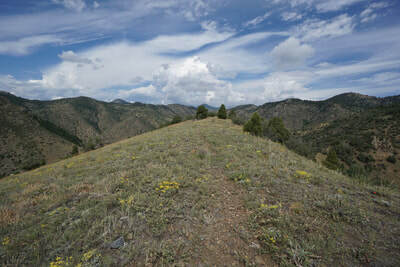 Climb the hill to arrive at the high point of the trail and the summit of Huntsman Ridge. 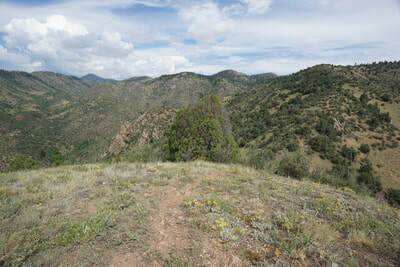 The views are even better from this vantage point. 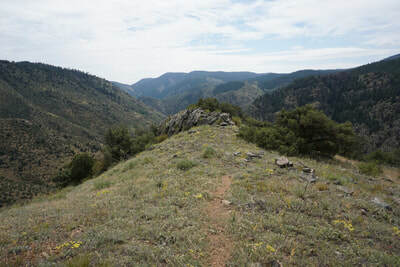 The trail continues downhill along the ridge to a boulder pile. 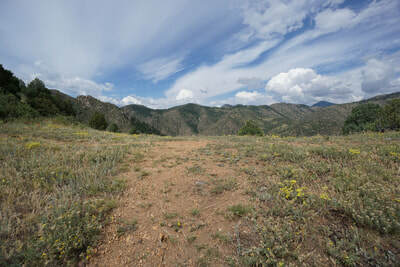 This marks the end of the good trail. 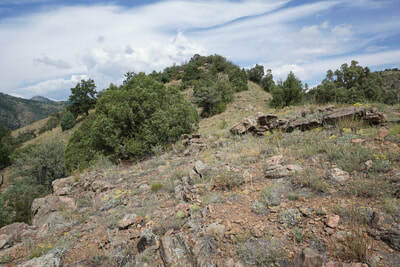 However, a faint trail and easy route finding continues along the ridge. Follow the ridge as far as you want but the ridge ends at a rock tower that probably has been named by local climbers, anyone know the name? 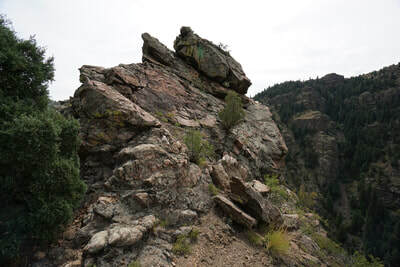 Along the way there is some fun, easy scrambling but summit the rock tower requires some more advances moves, it is very exposed. 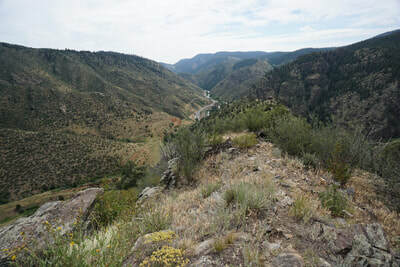 From the rock tower you can look down on one of the narrowest parts of the canyon and look down on all the rock climbers below. 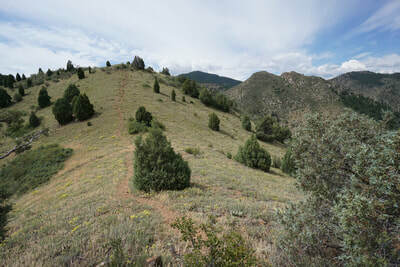 While you could probably bushwack a loop out of this trail, the actual trail returns to the saddle and down the gulch to the trailhead. 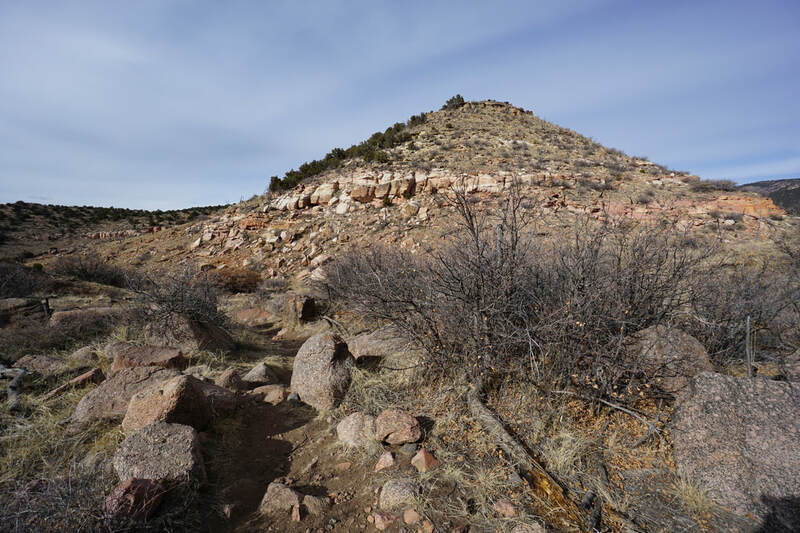 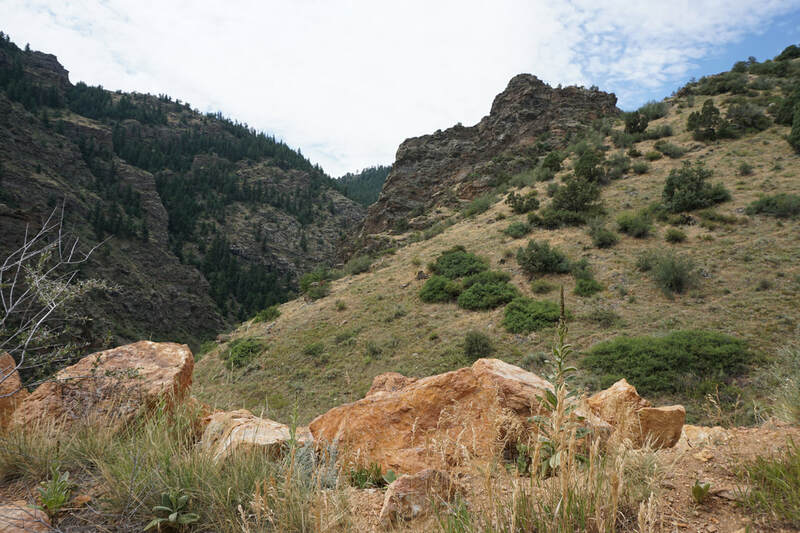 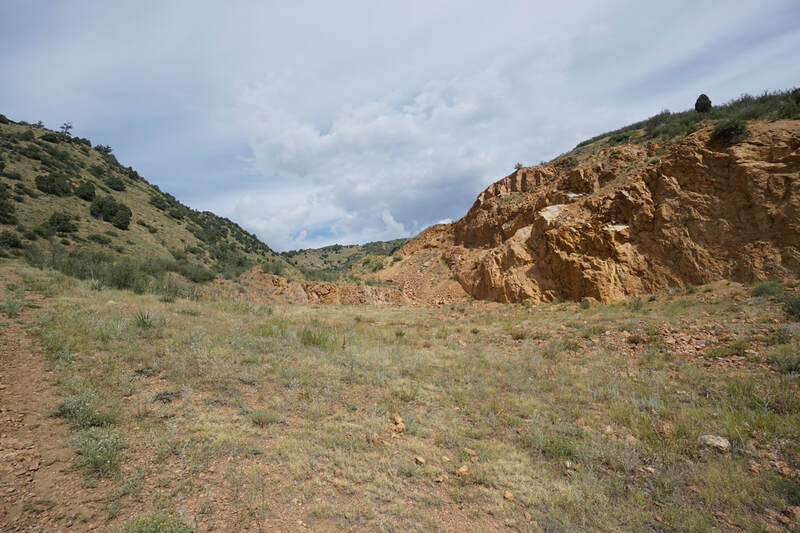 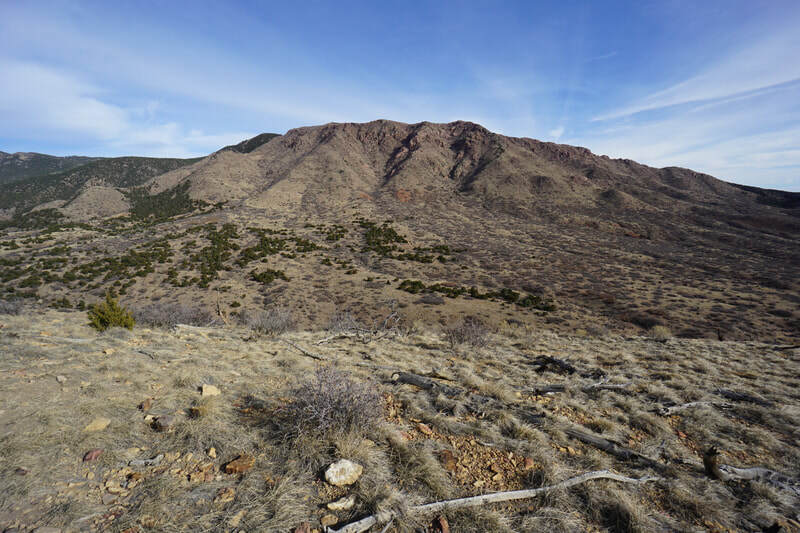 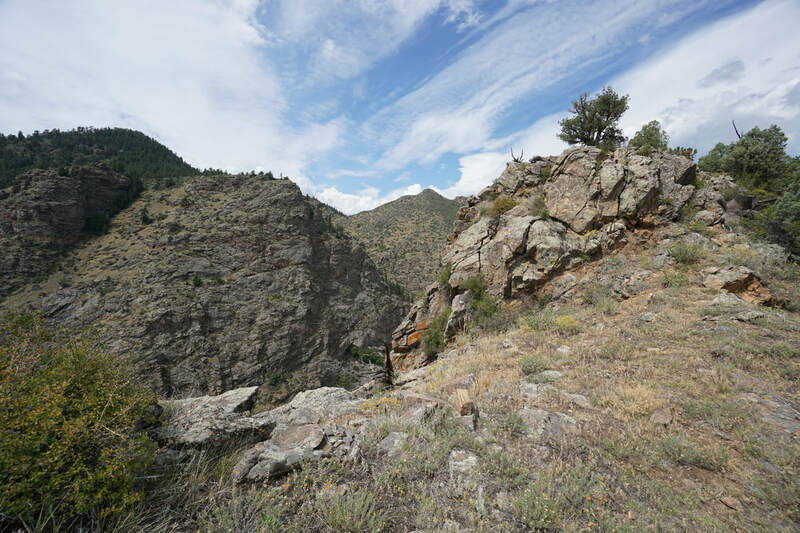 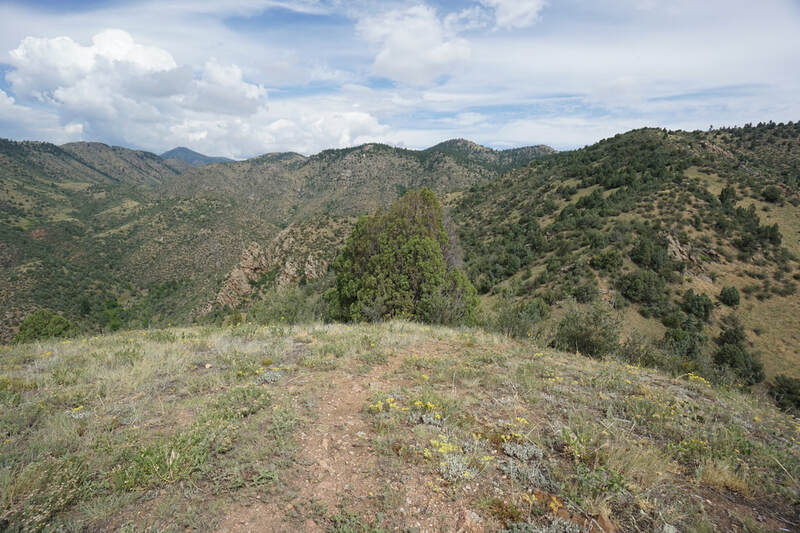 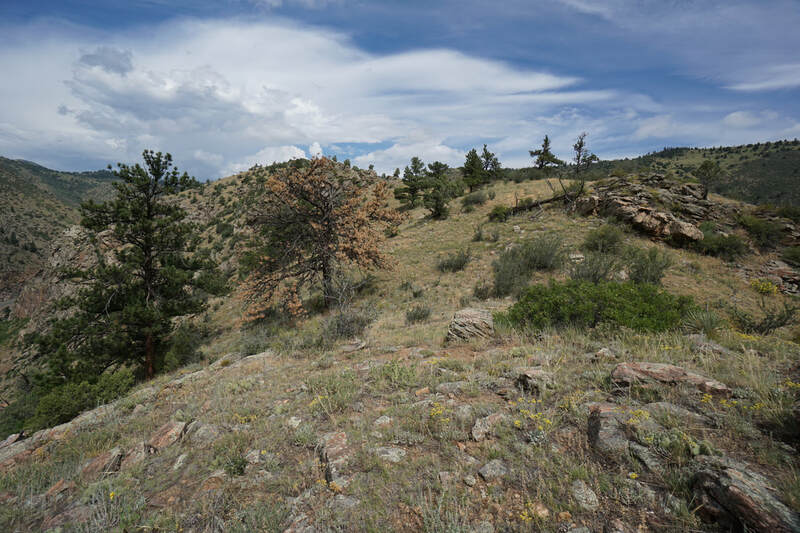 This trail is wonderful because it is relatively unknown and provides a rare hike within Clear Creek Canyon. The only official trail in the park that climbs up the canyon is the Mayhem Gulch Trail which can be extremely busy. Huntsman Gulch provides some rare solitude and a chance to get up on the canyon rim, an area typically only seen by rock climbers. 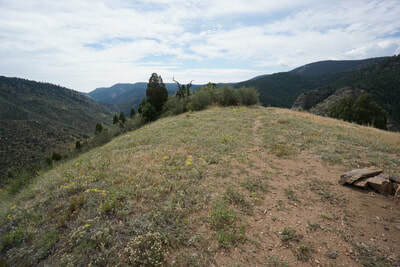 The trail steep but not that difficult, just be careful on the ridge as there is quite a drop on both sides.